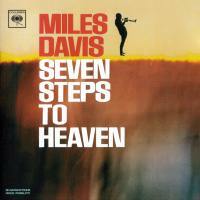 Miles’ Seven Steps to Heaven was recorded in April/May 1963, and documents the Miles Davis group in flux, making the transition between the Coltrane/… groups of the late 1950’s–early sixties, and the ‘classic’ quintet with Wayne Shorter et al. 7STH is basically Miles + George Coleman, with two rhythm sections: Victor Feldman, Frank Butler and Ron Carter (on five tracks), and then Herbie Hancock, Ron Carter and Tony Williams on the remaining three May 14th tracks (my Columbia reissue comes with two tracks not-on-original-LP). Here’s a post on Keep Swinging listing some jazz CDs with “hidden tracks”. EST always seem to make sure to hide something at the end of the disc, after about 15 minutes of silence… I think Polar Bear’s last one did the same thing. Pity is, in EST’s case, for Strange Place for Snow it was actually the best part of the disk.